Mr. Patrick LeBeau sent a beautiful message to the “Squad Leader PreASL” YahooGroup to remember John Hill. I asked and he kindly gave his permission to republish it here, for all of us whose memories Lt. Hill will forever be a part of. The original John Hill Squad Leader counter: Lt. Hill, a modest 9-1 leader. When I purchased the famous purple edition of John Hill’s 1977 Avalon Hill game, Squad Leader, at the Origins held in Ann Arbor, Michigan that same year, I and many others were immediately hooked on the game system and ease-of-play. We attended all of John’s lectures and in a day or so mastered the game. By the end of the convention many of us were combining our game boards and units to play monster self-designed scenarios after having played all 12 scenarios in one long weekend. This was not my first encounter with John or his many excellent board and miniature games. Most notably in the mid 1970s was Johnny Reb, now known as Johnny Reb One. I still have the original mimeographed legal size cheat sheet printed on both sides, which was all you needed to play the first iteration of the Johnny Reb system. In that playtest addition, resolution used a single 12-sided die. I mention these two games and I call them systems because they have an incredible longevity through continuous reprints, revisions and new editions, including new games derivative of earlier manifestations. Although the 1977 edition of Squad Leader is my all time favorite, the game would generate many supplements, which would lead to the development of Advanced Squad Leader. The whole Squad Leader family of games has sparked a gamer following that keeps the game alive (SL or ASL) to this day after almost all of the SL and ASL games are long out of print. ASL is directly responsible, I believe, to the development of the online VASSAL game engine for playing board/miniature games virtually. Johnny Reb would lead to JRII and JRIII. From my perspective, I see Across the Deadly Field as John’s Opus Majus and final version of the Johnny Reb system. From my point of view, I believe ADF is his finest version and I hope it will emerge as his most popular American Civil War gaming system. I spent the entirety of 2014, from Fall In 2013 to Historicon 2014, and all those conventions in between, promoting ADF. This brings me back to Lt. Hill, the U.S. 9-1 leader counter of the original Squad Leader. Many of us literally wore out our original counters due to continuous game play and finger handling. We of course replaced them by purchasing new games. This is not true with 99% of the board games I own. Further, in 1977, we understood the game as cardboard version of a miniatures game. Today I play the game using 15mm figures and terrain. My point is that as long as gamers continue to play John’s games he lives on. 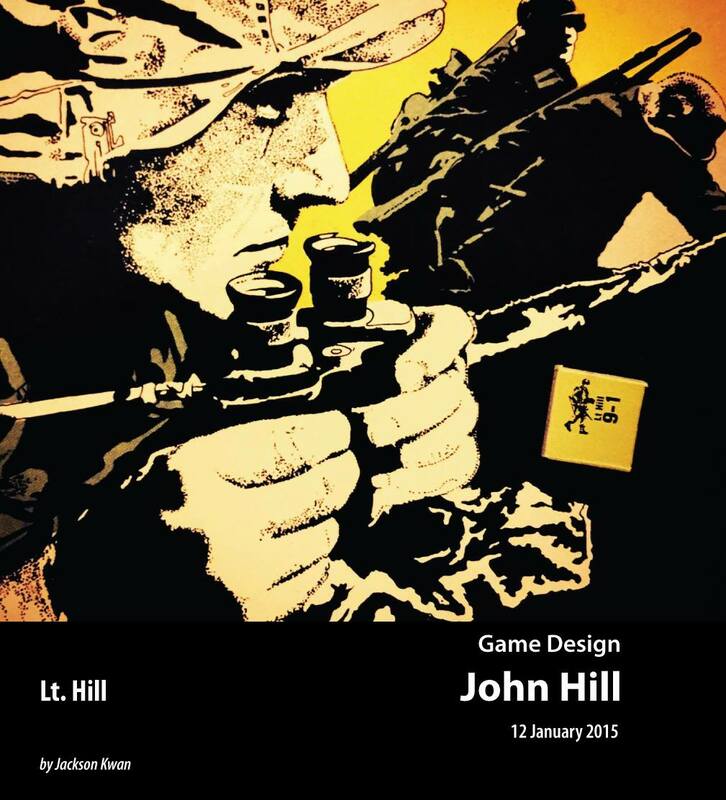 In untold thousands of games, his old Lt. Hill counter has often suffered a KIA result or has broken under fire. At times it has conducted heroic acts, or has rallied squads at critical times. Whatever the outcome, Lt. Hill reemerges game after game to fight on and on to the enjoyment of the table top gamer whose only purpose is to have fun, learn history, study tactics, engage in competitive play and build friendships. John was a good friend and his games build many life-long friendships. I will miss him. We will miss him. However, as Lt. Hill, he will always be in our games, not only as a counter, a figure, a GM, a moderator, a game designer, a human, a man, and as one of the greatest game designers of all time. This entry was posted in Events and tagged Advanced Squad Leader, ASL, board wargames, John Hill, obituary, Squad Leader, wargames, Wargaming, World War II. Bookmark the permalink. Very true. The narrative is one of the most powerful part of this game. There’s an epic story in almost every game! I’ll treasure my memories of sharing a breakfast table with John in Tempe . . . with everyone hanging off every word of his interesting tales and witty observations. He’ll be missed. You are lucky to be able to do so! I played in a demo of Johnny Reb at Michicon in the winter of ’77 & still have the mimeographed charts & tables sheet> I’ve played lots of ACW rules, but this is still the best. His enthusiasm was certainly contagious! Enthusiasm sells, no doubts!! I heard a lot about Johnny Rep.